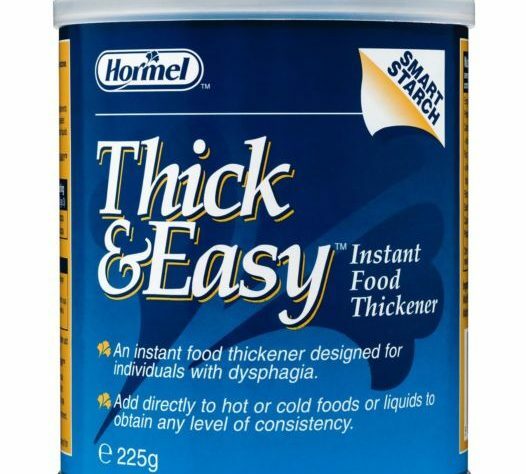 Thick and Easy is a liquid food thickener used for elderly people and people with conditions that make swallowing difficult. Dysphagia ( the medical term) is a common, yet potentially dangerous condition which can result in liquid entering the windpipe leading to aspiration and aspirational pneumonia. Dysphgia diagnosed by a GP. A swallow test is usually carried out by a speech and language therapist (SLT) and can give a good initial assessment of their swallowing abilities. The SLT will ask them to swallow some water. The time it takes them to drink the water and the number of swallows required, will be recorded. They may also be asked to chew and swallow a soft piece of pudding or fruit so the SALT can look at how well their lips, tongue and the muscles work. If it is deemed necessary the SLT will recommend a thickened diet. This is staged with stage one being the first. This means that for each 100ml of fluid one scoop of Thick and Easy needs to be added. Other makes exist such as Nutriate, Resource, and Thicken Up. 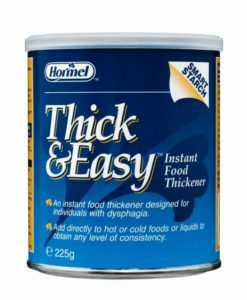 I have tried a drink thickened with Thick and Easy and to be honest the flavour is pretty much the same but the texture is obviously very different. It is known that thickened drinks make the person more thirsty which is a bit of a double whammy and important they are offered drinks regularly. It is also thought to fill people up faster making them less likely to eat well.